The grant will support a project manager who will act as a liaison and provide training to individuals from Cape Abilities for a variety of production-based, ocean science and technology projects. “This will provide a resource for scientists to have high quality products created, while also demonstrating that people with disabilities can be part of complex work,” said Rob Evans, a senior scientist in the Geology and Geophysics Department who will lead the effort at WHOI. Evans first teamed up with Cape Abilities in 2009 on a project to build electrodes for deep-sea instruments used to measure naturally occurring electric and magnetic fields on the seafloor. The instruments were needed for research at a subduction zone, where the plunging of one of Earth’s tectonic plates beneath another can trigger earthquakes and tsunamis. The electrodes were completed and deployed in 2013. “The individuals from Cape Abilities did a great job and the quality of the products that were produced were high,” Evans said. 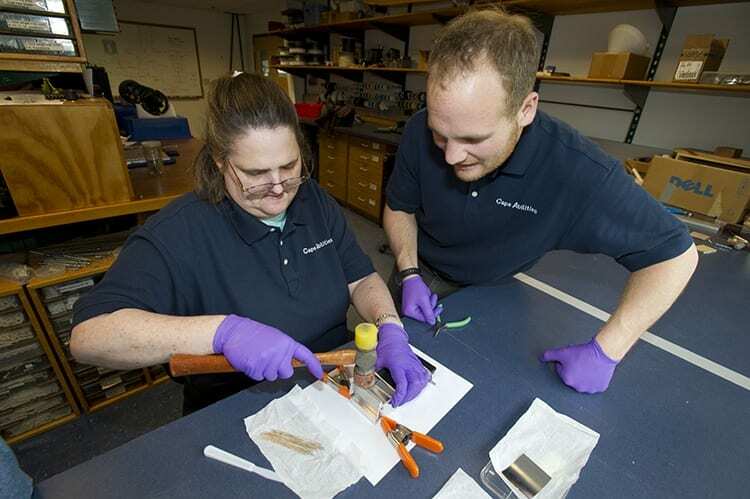 Originally funded by a National Science Foundation (NSF) grant, the pilot program paved the way for more partnerships between WHOI and Cape Abilities. Workers have produced sediment traps for a study on wind erosion, built battery packs for a variety of oceanographic instruments, and helped prepare dried sediment for chemical analysis as part of a project studying ancient hurricanes. “Employment at WHOI provides unique opportunities for Cape Abilities participants to take part in research projects conducted by the world’s leading oceanographic institution, creating pride and a truly gratifying experience,” stated Tom Zurn, Associate Director, Cape Abilities. While the NSF funding for the program ran out last June, the Tower Foundation grant will enable the project manager to work with a Cape Abilities job coach to coordinate two or more collaborative projects at WHOI each year. The exact projects are still to be determined, but Evans said at least one would involve building more electrodes for his lab. “We’ve already got a working model in place, and we’re looking forward to continuing the collaboration with Cape Abilities thanks to this new funding from the Tower Foundation,” Evans said. The Tower Foundation, which is based in Getzville, NY, supports community projects that help children, adolescents, and young adults affected by substance abuse, learning disabilities, mental illness, and intellectual disabilities achieve their full potential. The pilot program paved the way for more partnerships between WHOI and Cape Abilities. 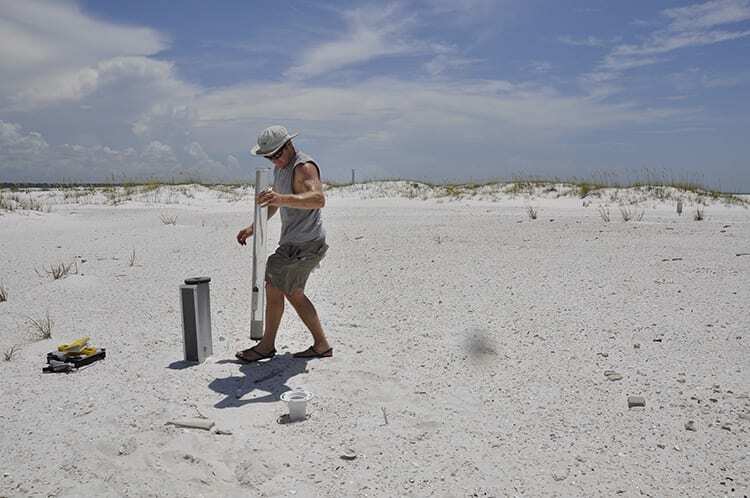 Workers produced sediment traps for a study on wind erosion on Florida's Santa Rosa Island in 2012. The data collected from the traps help scientists in WHOI's Coastal Systems Group model the formation and evolution of barrier islands in order to better predict the impacts of changes in such variables as sea level and storm frequency.